Get your Southsider gear on and show your love for the Chicago White Sox! 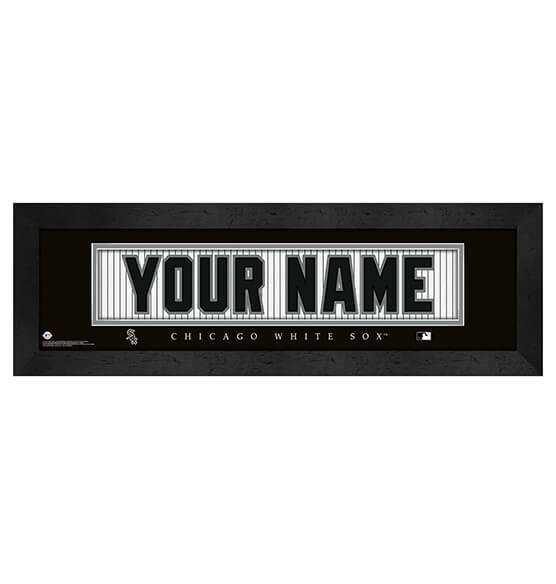 Whether you're a ChiSox fan or love one, you'll want a Chicago White Sox MLB Custom Nameplate to add to their (or your!) fan cave. Designed to look like the back of a Chicago White Sox jersey, this high-quality sports decor is customizable up to 12 characters. A handsome black wood frame and an eye-catching horizontal positioning makes this custom Major League Baseball gift one they will love to receive! It arrives ready to hang thanks to the convenient sawtooth hanger on the back.